The Loughran House, named after its builder and first owner, is a Victorian style house built between 1872 and 1873. Dr. Robert Loughran (1834-1899) was born in Delaware County, NY to Scots-Irish parents. By 1854 he was apprenticed to Dr. Dewitt of Saugerties and graduated from the Albany Medical College in 1857. Over the course of his life and career, he became one of Kingston’s leading citizens. Dr. Loughran entered politics in 1860, being elected to the New York State Assembly. He served in the Civil War as a surgeon in the 20th regiment of the New York State Militia from 1861-1866. Wars often advance the science of medicine due to the large scale of patients and greater opportunities for the development of new treatments. The Civil War turned out to benefit Loughran’s individual professional development as well. In 1864 he admitted that he “entered the organization comparatively inexperienced.” After the war, though, Loughran returned to Kingston, where he established a successful medical practice, first on Wall Street, and later in this house. Dr. Loughran also returned to politics and served in many professional organizations. Among his many positions, he was Alderman of Kingston’s First ward, President of the Ulster County Medical Society, Vice President of the Kingston Savings Bank, and a member of the County Board of Supervisors. In 1870 Loughran bought the 103’ by 109’ lot on Fair Street for $2,900. Two years later he married Helen Kierstedt Schoonmaker and the couple eventually had five children. In 1872 he commissioned house plans from noted architect J.A. Wood. Most of the structures designed by Wood are found in the Hudson Valley, but his buildings are also found in Pennsylvania, Florida, Georgia, and Cuba. Several are listed on the National Register of Historic Places, including the Ponckhockie Union Chapel in Kingston, the Newburgh Free Library, and the Vassar Brothers Institute in Poughkeepsie. Wood also designed the building across from the Loughran House, the former Stuyvesant Hotel, built 1910-11. The house Wood designed for Dr. Loughran is Victorian Italianate, a style popular in the United States, especially the Northeast, from the late 1840s to about 1890. The Italianate style of Victorian Houses is so named because of the design features influenced by the country estates of Northern Italy. As is typical with Italianate houses, the Loughran House has a simple rectangular footprint supplemented with many ornamental details. The structure is topped with a square cupola. Other elements common to Italianate houses that are evident in the Loughran House are a low pitched roof, an elaborate cornice supported by paired decorative brackets, a circular window near the roof line, and tall, narrow windows, particularly those with rounded tops. Also note the columned porch, turned balusters, and a striking double-door entrance, which is a masterpiece in its own right. Upon entering the house, notice an elegant chandelier, a beautiful curved staircase and other ornate details, such as intricate moldings and carvings along the staircase, which define Italianate houses. In 1932 W.N. Conner’s Funeral Home began using the Loughran House as offices, and the building remained a funeral home until 1965. The New York State Historic Trust acquired the house in 1968 for $98,000. 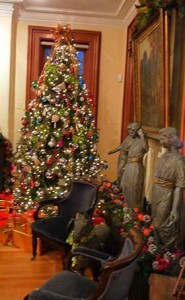 The building is now part of Senate House State Historic Site, and is used for offices and changing exhibits, and is the site for Victorian Teas hosted by the Friends of Senate House.